This is the fifth and final audio blog lesson in the Get Edified! Marketing and Sales Series, a complimentary series of lessons for entrepreneurs, business leaders, and anyone who sells a product or idea. Whether you’re selling to make a living or seeking to convince someone to adopt your idea, these lessons apply. In short, this series is for everyone because everyone sells in some form or fashion. This lesson applies to leadership, sales, speaking…and life. In whatever area of influence you have, this lesson is highly applicable. In this article, I am sharing the “Selling with Swagger Toolkit” you need to sell and lead well. Here are the tools you’ll need. If you are going to sell a product or service, it is your responsibility to know all you can about that product or service. You should make it your business to know your business. This engenders trust on the part of your potential customer and underscores your confidence in what you are selling. If you have done your homework well, you know that what you are selling will help the person you are selling it to; and, therefore, you are creating a win-win situation. Any conversation can be a challenge, but it is a challenge that can be alleviated through practice and good coaching. The most important part of communication is something we can all do – it is listening. Ask questions, and listen to the answers. Listen for the needs that surface within the conversation. Good communication helps identify the needs you can fill. From that point, selling becomes a simple matter of matching needs with a solution. When you have a positive attitude and outlook – particularly when times are challenging or tough – it not only influences you, it also influences others in a good way. Leaders must maintain positive attitudes. Being positive in spite of exterior circumstances is what makes a leader a leader. It doesn’t mean we are delusional. It doesn’t mean we whistle past the graveyard, and don’t look at the reality of the situation. And it doesn’t mean we are not confronting the circumstances. The fact is, we are, indeed, confronting the circumstances. We are doing so with a resolution to overcome them and maintain a good attitude while going through them. This kind of realistic optimism is connective. It makes people realize you are aware of all that is going on around you, but that you have intentionally chosen to maintain a positive mental attitude. It inspires them to meet their circumstances with that kind of attitude as well. Have you ever been in an audience where the speaker is obviously losing it in terms of composure, control, and confidence? The discomfort of the speaker is tangibly felt across the audience as well. It is nerve-wracking for everyone. This is true of sellers as well. Your confidence puts your potential customer at ease in the conversation. If you want people to believe in you, you must believe in yourself first. It’s extremely important to remember that. When it comes to selling, you can never go wrong if you approach it from the perspective of service. Think of two car salesmen. What he has failed to observe is that you have a baby of your own – and a car in the parking lot that is bulging with family. A sports car is the last thing you need right now. But he didn’t even ask what you were looking for. One of these salesman has a heart of service, and one is just looking to make a sale – and you as the customer know the difference. Always remember that the person to whom you are speaking is giving you their most valuable commodity: their time. Honor that by being grateful for their gift. And go beyond, “Thank you,” to an act of thoughtfulness that goes beyond the conversation. If they buy from you, add in a thoughtful gift or bonus of some kind to show your appreciation. Even if they don’t buy from you, find a way to show them you appreciate their time. Every successful athlete uses the power of visualization. Long before they’ve won the gold medal, they have envisioned every step along the way. They have envisioned themselves on the podium. In selling, you must visualize the successful outcome of your work with a perspective customer. Just like the athlete, well before you go into a sales call, it is extremely important to visualize them working with you. If you do that, it will be a source of positive energy for you. Essentially by envisioning your success, you have created the means to make it happen. While it may not happen every time because you cannot control the other person’s thoughts, you will leave a much better impression on them by envisioning success. Another way to sell with swagger is to use the perspective customer’s favorite word: their name. When you use someone’s name, their interest naturally peaks. Use it respectfully and without overdoing it, and it is a simple, yet powerful tool. Other sources of swagger are affirmations or testimonials. Read a few prior to going into a sales interaction. Read a set of testimonials that have been written about you, positive things that have been said about you. If you have had positive interactions with clients, ask them to share with you what those positive interactions are. This is not about becoming an egomaniac. It is about knowing that what you do has genuine value to others. And with that realization, it gives you confidence to serve more. John Maxwell talks about the Law of the Inner Circle, and the concept of surrounding yourself with those who are positive thinkers and focused on success rather than failure. The quickest way to lose a sale is to surround yourself with people focused on failure. It follows that the opposite would be true as well. If you don’t have a strong inner circle where you are, find them online. Join a mastermind group. Watch videos. Your inner circle can also be like my office, where I have purposely chosen to surround myself with books by the likes of Zig Ziglar, John Maxwell, Jim Rohn, and many others, living and deceased. 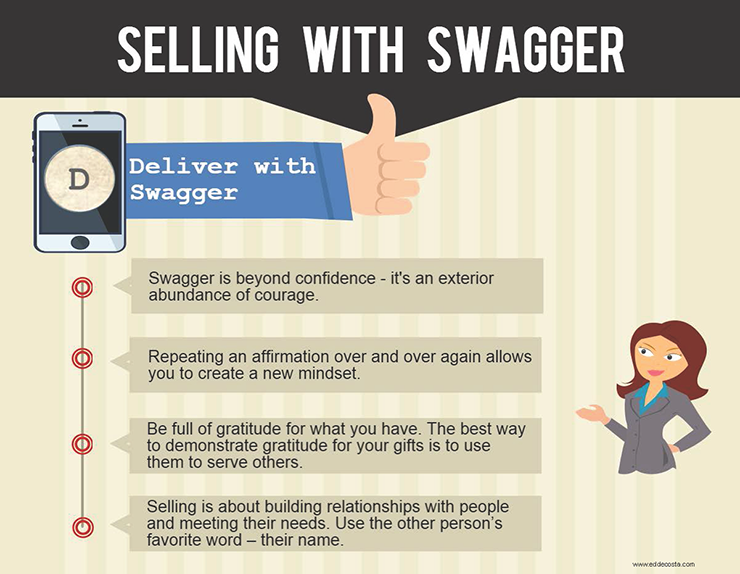 Selling with swagger is selling with authentic confidence. It is realizing you have a gift to share with the world and that some people will choose to accept that gift, while others will not. The key is to equip yourself well to serve those who need your gift. Build your Selling with Swagger Toolkit now before you need it. If you missed any of the previous four lessons, click on the lessons link below. Lesson #1 – Does Your Steak Sizzle? Lesson #2 – Where’s the Beef? 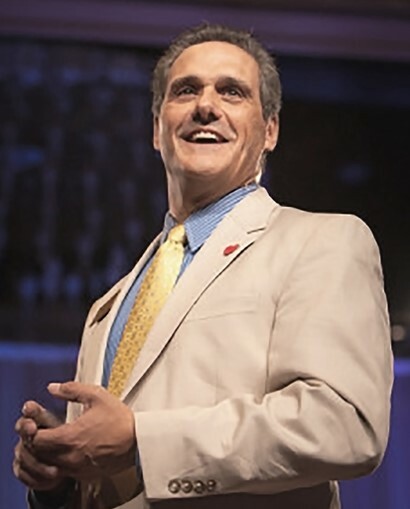 Need a business coach? Click here to schedule your complimentary discovery session. Limited times available. Apply your passion – take action! I always appreciate your honest approach to selling. The “toolkit” is logical and easy to understand. Thank you for all you provide to help us to improve! Thanks for reminding me to serve people from the area of my strength. I think it is so important to remember that and not get carried away by what others may be doing. Thank you Ed.